Wild handkerchief bush is a fruit from Tropical Africa as well as Madagascar. It grows wild in forests and banks of streams. The fruits are eaten by local people. Occasionally one tooth of the small 5-pointed green flower cup enlarges to a white or cream blade waving in breeze like a handkerchief. Hence the popular name “wild handkerchief bush”. 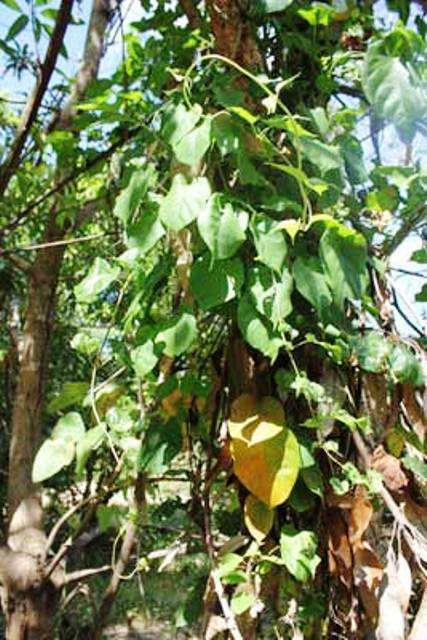 A shrub to 2 m tall or a creeper growing up to 8 – 10 m long where not subject to annual burning. Leaves opposite, elliptic to almost circular, shiny dark green above, paler, often sparsely velvety below; stipules often 2-fid at apex. 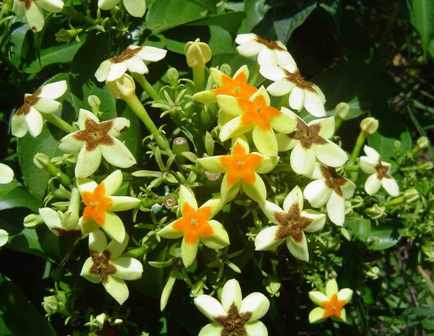 Flowers in dense panicles on short lateral branches, pale yellow with a bright orange star of hairs in the centre, turning brown with age. Fruit ellipsoid to almost round, scarred at the apex by the old calyx, 1-1.25 cm long and 0.5-1 cm wide, edible, mildly sweet, purple when ripe. 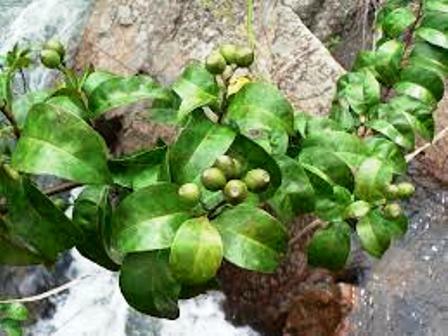 Wild handkerchief bush fruits are eaten by local people. Fruits are picked when yellow. The inner pulp is squeezed out. Outer skin is discarded. Though some people opine that the taste is insipid others report it tastes like a mixture of kiwi fruit and figs. The fruit can also be made into jam. Leaves are sometimes eaten as spinach in Ubangi. 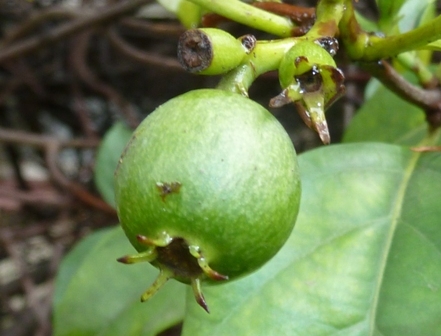 New plants of this fruit which are still collected mostly from the wild, can be raised from cuttings. The seeds also germinate easily but are too small to handle and are also not easy to separate from the pulp. The plant starts flowering after two years and grows into a large bush after a few years.